Anybody interested in heading up a team? 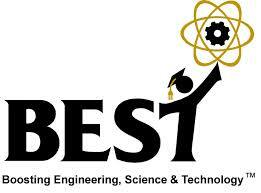 BEST is a non-profit, volunteer-based organization whose mission is to inspire students to pursue careers in engineering, science, and technology through participation in a sports-like, science and engineering-based robotics competition. BEST Robotics Inc. (BRI) is a non-profit, volunteer organization based in Dallas, TX. Started in 1993 with 14 competing schools and 221 students, today BEST has over 700 middle and high schools and over 10,000 students participating each fall. There is no fee for schools to compete in BEST. A robotics game, which is based upon an annual theme with four teams competing at once in a series of three-minute, round-robin matches. The BEST Award, which is presented to the team that best embodies the concept of Boosting Engineering, Science, and Technology. Elements include a project summary notebook, oral presentation, table display, and spirit and sportsmanship. Each school is provided kits of equipment and parts, a set of game rules, and given six weeks to design, build, and test a small Radio/Controlled (R/C) robot that outperforms other robots. Winning teams from local competition sites (called “hubs”) advance to regional championship sites (“regionals”). Engineers and other technical professionals from local industries serve as team mentors who advise and guide students through the design and construction of their machines. Anyone—colleges/universities, corporations, individuals—can start a new hub serving a minimum of eight teams. The average first-year cost for running a 24-team hub is approximately $28,000. Local hubs rely on financial support from corporations and/or colleges/universities in order to allow schools to participate at no cost.